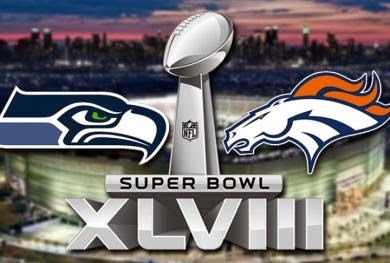 The Life and Travels of The Ellingers: Superbowl 2014 - Seattle Wins! Today Emily and I invited a bunch of people over to our place to watch the Superbowl with us but as usual because of where we live not many showed up. Eric bailed because of a family member health scare but Arley and Katie came over with some delicious football shaped brownies. Emily and I had bought plenty of drinks and we also had some wings and chips to share. The game itself was a blowout as Seattle crushed Denver who looked like a High School team in comparison. It was nice to hang out with Arley and Katie and we appreciated them making the drive to spend the afternoon with us.